LIMITED & NUMBERED EDITION OF ONLY 999 PIECES WORLDWIDE! Designed by Henrik Fisker, who created many of the most emblematic BMW and Aston Martin cars, it embodies the power and determination of instruments that are authentic, mechanically irreproachable and envied by all. 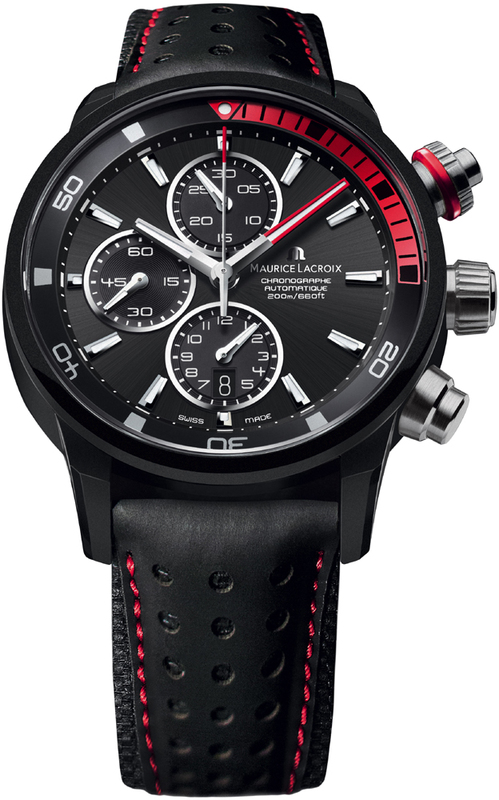 The POWERLITE case & bezel are made of a special alloy unique to Maurice Lacroix. POWERLITE is an alloy combined of five elements: aluminum, magnesium, titanium, zirconium and ceramic. The result is a highly durable & light-weight material. Case is completely black through an anodization process, which make the coating very durable & lasting. An additional striped black and red NATO (Nylon) long strap (fits over diving/flight suit) included. Controlled by a ridged nut on the start/stop chrono button located on the case edge at the 2 o'clock position. The diving bezel ring is black with red 15 minute zone. Matte silver 5 minute incremental markings for the entire bezel. Red highlights on the minute hands, chrono seconds hand, the top pusher, and part of the inner bezel. 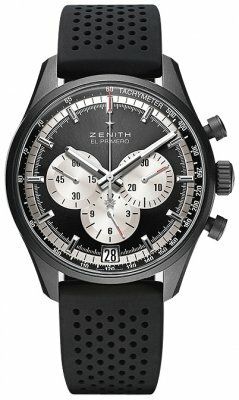 30-minute chronograph at the 12 o'clock position. Small seconds dial at the 9 o'clock position. Date displayed at the 6 o'clock position with the subdial. Maurice Lacroix Caliber ML112 (base calibre Valjoux 7750), beating at 28'800 vph, containing 25 jewels, with a power reserve of 46 hours.